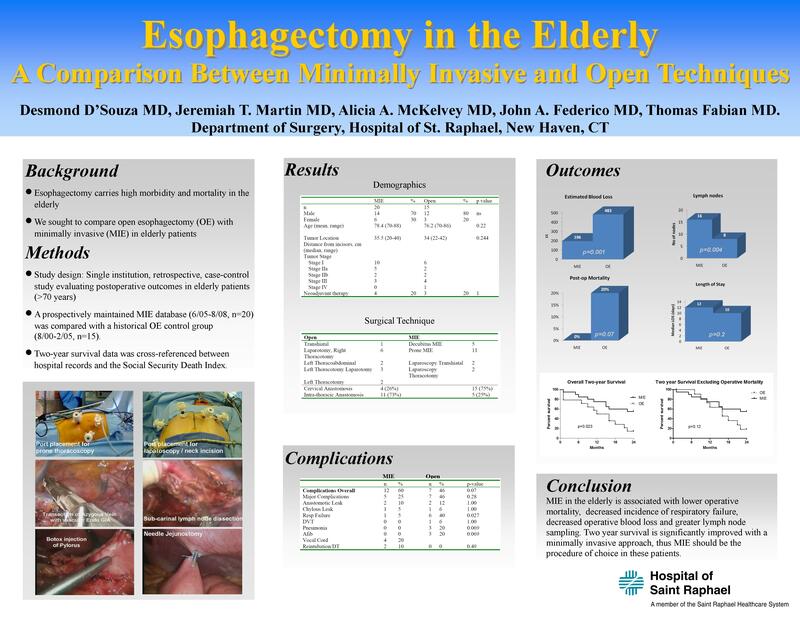 Background: The purpose of this study was to determine if utilization of minimally invasive techniques for esophagectomy in the elderly results in decreased complications compared with traditional open esophagectomy. Methods: A retrospective, case-control study was performed comparing outcomes after minimally invasive esophagectomy (MIE) and open esophagectomy (OE) in elderly patients (age>70 years) over a 7 year period (July 2001-Aug 2008). Utilizing a prospectively maintained MIE database comparisons were made to a historical OE control group during the 4 years immediately prior to initiation of our MIE program. Patients who underwent OE during last 3 years were excluded. Results: Twenty patients underwent MIE and 15 patients underwent OE during the study period. There were no conversions to open in the MIE group. Occurrence of complications were similar between MIE 12 (60%) of 20 and 7 (47%) of 15 and OE groups respectively (p=0.5). Operative mortality was less, but failed to meet statistical significance, in the MIE group 0/20 (0%) than the OE group 3/15 (20%)( p=0.07). Lymph node procurement was higher 15.5 (2-30) nodes in the MIE group than the OE group 6(0-30) nodes (p=0.004). Length of stay however was not different between the two groups 12 (8-34) vs. 10 (8-117). Conclusions: MIE in the elderly can be performed safely with low mortality. In experienced hands it may be safer than open esophagectomy.